Nook Fencing is a United States Fencing Association (USFA) affiliate with training designed for all levels of fencing athletes. Our USFA certified coaches have tremendous experience and are committed to making this one of the finest fencing academies in the region. Learn fencing fundamentals or hone the skills you already have by working with the best. Open bouting and fun, competitive tournaments offer the chance to put those skills into practice. Classes meet all year round. For more important information on our Beginner’s and Intermediate fencing classes, please contact fencing@nooksports.com for the latest FAQ. Nook Fencing offers open bouting with electric strips for experienced fencers. Fencers must be current USFA members and provide their own gear. 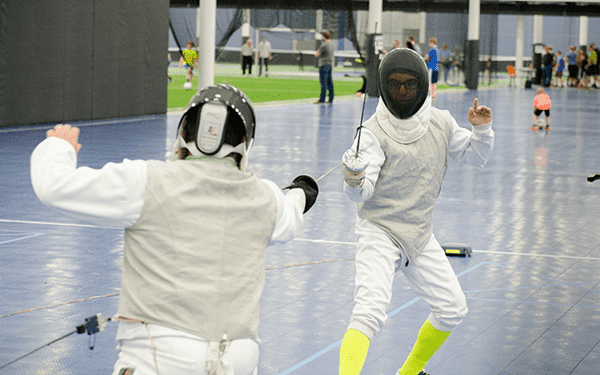 Fencers aged 14 and under must be accompanied by a parent or guardian. Fee: Members and Non Members: $8 per session.